Healthy Workplace Swag winners: Nanci Jolicoeur, Kelly Callan, and David Sterritt! Congratulations to everyone who participated, and who continues to take the stairs on a daily basis! Step up to a healthier lifestyle and take the stairs! 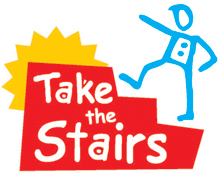 The “Take the Stairs” challenge runs throughout the month of May and is open to all employees. Rack up points every time you take the stairs instead of the elevator for your chance to win great Healthy Workplace prizes, or the grand prize – a $100 Sport Chek gift card! It’s easy to participate. Click here to register, and you can pick up your counter card from 1310 Dunton Tower. Once you receive your counter card, you can start amassing points each time you take the stairs. Add up your total number of points at the end of the month and submit your counter card to enter the prize draw. PLEASE SUBMIT YOUR CARD TO 1310 DUNTON TOWER! After a month of climbing stairs, you can participate in the final Dunton Tower Stairs Challenge on May 30th! Increase your life expectancy: A Swiss study recently concluded that regular stair climbing leads to a 15% decrease in the risk of dying prematurely. Breathe: stair climbing uses large lower body muscle groups and provides a great cardiovascular challenge. Steady breathing throughout your climb will provide oxygen to your muscles and help fuel them to move on. Find out how many calories you burned by using this online calorie counter. See how fun walking can be!